This centre is a fully furnished professional office building offering a range of professional services and facilities on site; including fully furnished office suites, conference facilities, flexible terms, spacious meeting rooms and on-site management teams to provide support and assistance to clients. Local transport links are also excellent, with a number of road and rail networks near to the site and secure parking provision making the centre easily accessible. 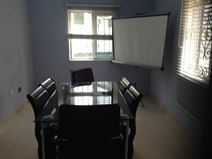 With a wide choice of fully serviced and furnished suites, coworking space and virtual solutions, this centre is in the heart of Nigeria"s Federal Capital Territory and is surrounded by the country"s leading financial and corporate institutions.The site provides administrative support, 24-hour access, breakout space, on-site management, a professional reception area and conference facilities to support day-to-day business activity. Exclusive serviced offices are available in a strategic location with excellent range of facilities - fully-equipped conference rooms, dedicated network access and flexibility in renting the office. Prestigious location in the centre of Abuja-Maitama, which is a few minutes’ walk away from banks, eateries and hotels. Excellent transportation with good public transport options and convenient road access. Located in the heart of the Central Business District of Abuja this stylish glass building provides a home to a range of furnished private executive suites, co-working areas and open-plan office space. Just around the corner from consulates and embassies and surrounded by retail outlets, coffee shops and restaurants. In addition, the centre is accessible 24/7, so you can work through late hours; ideal for businesses with international clients/colleagues, and may need to collaborate across different time zones. This wonderful space is easily accessed by car via the Ibrahim Babangida Way, perfect for commutes. Strategically located in Maitama, the heart of Abuja this business centre is a short walk from The Embassy of the Islamic Republic of Mauritania and The Poland Embassy in a quiet and peaceful area. The collaborative workspace is clean and modern with options available for all types of business, as well as a sought-after working atmosphere. 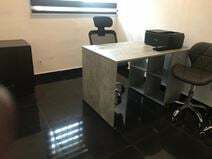 Found in the heart of Abuja, this business space offers great office solutions including fully furnished offices and access to conferencing room. A professional on-site team is available to ensure your stay is comfortable as possible and all of your day-to-day queries are answered. The space is centrally located with great nearby amenities including hotels and eateries. The centre is easily accessed using public transport with a major bus and coach station just a short walk away. Each office is suited to your individual needs specifically tailored for when you arrive and even after you leave, if you so desire. Quality woodwork fills each office space, and these offices are exquisitely designed and you can occupy this space for a few hours, a week, a month, or even a year. Within walking distance you’ll find many local cafes, bars, restaurants and retail stores. Whether you’re meeting up with clients or socializing with your team there is something to suit all needs. 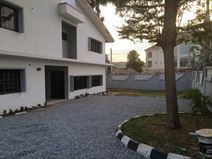 This easy to locate building provides fully furnished and equipped offices in the heart of Abuja. The well trained support staff will help assist with any requirements and provide support services as part of the terms of occupancy. On-site facilities include 24-hour security, comfortable breakout space, conference facilities, secure parking and air conditioning. There is a well trained support staff on hand to help while major shopping malls are close by. Found in an accessible and modern building in the heart of the city, this business space is ideal for professionals and their clients, making your operations easy and convenient. The building is kept tidy and professional with a regular cleaning service. The ecosystem within the business centre also allows you to become a part of an online and offline platform, enabling you to meet with like-minded and forward-thinking professionals. This ultra-modern two-storey building provides a range of workspace solutions including executive offices, workstations, a boardroom and a training room. All the virtual offices packages provides as standard the business address, lobby listing and mail handing. The building is close to embassies and federal ministries, giving your company a prestigious address. The business centre is easily accessible and offers on-site parking. This modern building stands in a serene environment with outstanding amenities that will ensure your business operates efficiently in a perfect environment. With high speed internet, videoconferencing, meeting rooms and a fitness centre, you will always stay well connected. Around the site, you can find a great selection of local amenities to take advantage of during lunch breaks, or for entertaining clients. This centre offers high-spec serviced offices with on-site, secured parking and excellent shared amenities. It enjoys a prime location in a highly reputable area of the city. The space offers conference facilities with videoconferencing on site for convenient presentations and connectivity. There is parking on site with security, and the surrounding area is highly commutable with lots of transport links within reach. This tall building is strategically located adjacent to Federal Government Offices in Abuja and provides a wide range of flexible office space solutions including access to meeting rooms, virtual office space, training rooms and well-equipped serviced offices. Next to the centre, you can find the Federal Civil Service Club, as well as the Almond Parks & Gardens. The regional transport links are also very good, with convenient road and rail services running frequently throughout the immediate area and its surroundings. This office space is committed in providing a sought-after business address in the heart of Abuja. In addition to its outstanding location, the office is also well-known for its excellent support services provided by qualified professional staffs. The tenants can also enjoy fabulous amenities such as spacious surroundings, advanced technology, modern workstations, speedy secured broadband and fully equipped business rooms. This office is located in the heart of central business district which is close to Transcorp Hilton Hotel and also nearby plenty of embassies, government offices, banks, cafés and restaurants. With a strong focus on helping co-inhabitants to succeed this business centre has created an innovative ecosystem in the heart of Abuja"s central business district. It is in a very quiet and clean environment yet very centrally located. 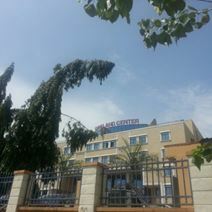 In addition to fully furnished and serviced office suites, the building features a number of exceptional and state-of-the-art facilities including conference facilities, spacious meeting rooms, air conditioning, copy/printing equipment, comfortable breakout space, a luxurious business lounge, a professional reception area and on-site support and management teams available around the clock. Offering a refreshing and ambient coworking space in the heart Abuja, this business centre provides modern and fully furnished coworking space. The space is designed to be spacious and serene, with a thriving business community that can give you and your business the boost it needs. Amenities include food and laundry services in the same building and around the area you will see a range of local amenities.